A SpaceX Falcon 9 rocket launches the Zuma mission from Space Launch Complex 40 at Cape Canaveral Air Force Station in Florida on Jan. 7, 2018. Another Falcon 9 will launch the GovSat-1 communications satellite from the same site on Jan. 31, 2018 after a 24-hour delay. SpaceX called off the planned launch of a Falcon 9 rocket on Tuesday (Jan. 30) to allow engineers time to swap out a sensor on the booster, company representatives said. The Falcon 9 rocket was scheduled to launch the GovSat-1 communications satellite Tuesday afternoon from a SpaceX launch pad at Cape Canaveral, Florida. The launch will now take place no earlier than Wednesday (Jan. 31), SpaceX representatives said. If that Wednesday launch happens, it will occur between 4:25 p.m. EST and 6:46 p.m. EST (2125-2346 GMT). "Standing down for today. Team is going to replace a second stage sensor," SpaceX representatives said in a Twitter update. SpaceX is launching GovSat-1 on a Falcon 9 rocket that contains a used first-stage booster that previously launched a U.S. spy satellite into orbit in May 2017. The second stage, which is used in the last leg of the launch to place GovSat-1 in orbit, is new. SpaceX does not plan to recover the used Falcon 9 first stage via a landing as it has in the past. As its name suggests, GovSat-1 is the first GovSat, a joint venture by the gorvernment of Luxembourg and the satellite-operating company SES. The Orbital ATK-built satellite carries anti-jamming features and encrypted telemetry and control systems to provide secure communication services, according to a SpaceX mission profile. 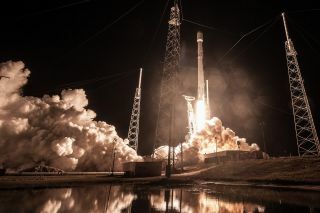 The GovSat-1 mission is the second spaceflight of 2018 by SpaceX following the Jan. 7 liftoff of the secret Zuma spacecraf for the U.S. government. SpaceX is also preparing for the much-anticipated debut launch of its new Falcon Heavy rocket. That test flight is expected to launch no earlier than Feb. 6 from Launch Pad 39A at NASA's Kennedy Space Center in Cape Canaveral.